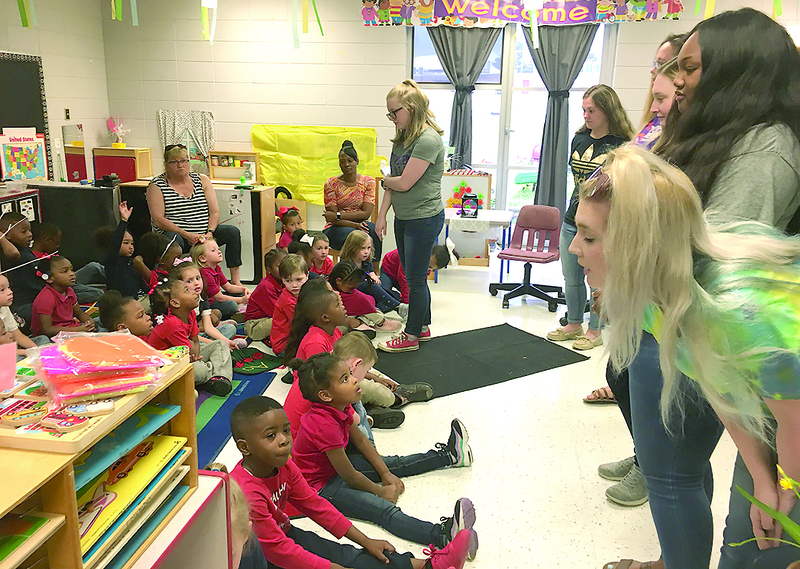 L. P. Vaughn Preschool Students enjoyed a visit from Northwestern State University biology students Friday, March 29. Preschoolers are involved in a project about nature that has led them to investigate the process of pollination and how bees make honey. As part of the inquiry process students were encouraged to document the information they already knew and form questions about what they wanted to learn. The use of the project approach allows students to experience the joy of self- motivated learning while developing reading and math skills. The Early Childhood Method Students, Martha Hopewell and Emily Salter, are working this semester in preschool and set-up the visit as part of their course work. During the visit the students identified the parts of a plant, asked questions about bees and learned a new song. All nine preschool classes participated in this activity. Students pictured with guests are, on front row from left, Rachel Fournier, Morgan Johnson, Jayce Wise, Tripp Troquille, Bailee Meziere, Hannah Lopez, Zoe Hernandez and Tequilla Winston. On middle row are Braylon Triplett, Jordyn Thomas, Shai’Dereon Scott, Audrey Rachal, Caidence Barriere, Emmalee Hunter, Harley Stewart, Austin Rachal and Sidney Spinks. On back row are Martha Hopewell, Kaylee Mcguffee, Sierre E. Laing, Alexis Trosclair and Emily Salter.